This weekend, you’ll be celebrating freedom. Freedom from fear. Freedom from want. Freedom from... waiting for your next beer. Which brings us to Meridian Pint, opening tomorrow night in Columbia Heights to bring a little independent spirit—and Washington’s first self-serve beer taps—to your drinking endeavors. You’ll start at the ground floor dining room, a sort of New Deal-era mishmash of reclaimed wood tables, machine gears on the walls and a propaganda mural that celebrates beer, which is always more engaging than the Tennessee Valley Authority. 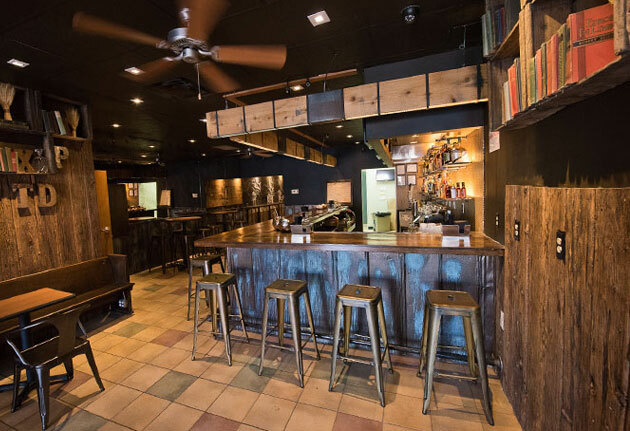 Then, you (and up to five like-minded comrades) will head to the dark downstairs bar, where you’ll find a pair of pool tables, but much more importantly, the aforementioned serve-yourself taps at the six-person booths. While you order up some American pub grub (Half Smokes with Pork Chili), you’ll signal to your server to turn on the spigot of these pinnacles of human achievement, which are set to dispense as many as a dozen standard pints of brew. If you need a refresher, fear not: a wall-length, blueprint-style mural includes handy drawings explaining how to pour the perfect pint. And no, you can’t grill your own hot dog.